The Ponche Quarter and the Portalet Tower which dates back to the end of the 15th century, a peaceful scene from the Port de Peche, in Saint Tropez, Provence in France. The Ponche Quarter of Saint Tropez in Provence, France, as seen from the Port du Peche, was once the fishing harbour for the town. The Portalet tower, Tour du Portalet, was finished at the end of the 15th century and was a defense tower for the area.The Ponche Quarter is worth exploring, with its winding, narrow streets where the houses and shops are part of the town of Saint Tropez before it was discovered by the 'popular crowd'. This is one of the nicest areas in town where the buildings surrounding the area emit a pleasant aura and the sunsets, the breeze coming off the water and the artistic past create a picture of the unique lifestyles of Saint Tropez.The Ponche quarter, Tour Vielle, and Tour du Portalet seen from the Port de Peche in St Tropez, The Var, Provence, France, Europe. 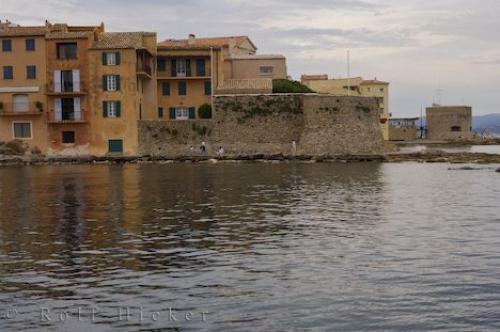 Photo of the waterfront view of the Ponche Quarter in the town of Saint Tropez in Provence, France in Europe.